The Comberford family and the cathedral city of Lichfield have been intimately associated in my mind since I first stayed in Lichfield as I began to research the origins and story of the Comberford family. At the time, I still accepted the long-standing belief that the Comerford family of Ireland was descended from the Comberford family of Staffordshire. Although research has since challenged that popular myth, my own associations with Lichfield have continued over the decades. I began my career in journalism as a freelance contributor to the local newspaper, the Lichfield Mercury, and continue to be grateful for the encouragement and opportunities provided by the Lichfield Mercury and its then editor, Neil Beddows, in the early 1970s. On a more personal level, my experiences in the chapel at Saint John’s Hospital, on Saint John Street, in 1971, and in Lichfield Cathedral, mark the beginning of a pilgrimage that led eventually to my ordination and priesthood. Many of the original historical documents concerning the Comberford family, Comberford Hall, and the family’s estates and property, including wills, transcripts and other records associated, are in collections in the Lichfield Record Office and provide the valuable primary sources for tracing the story of the Comberford family. In 1934, Wigginton and Comberford were transferred from the former Tamworth Rural District to Lichfield Rural District. Lichfield City Council and Lichfield Rural District Council were amalgamated in 1974 to form Lichfield District Council. Lichfield District covers 331 sq km in south-east Staffordshire, with a population of 96,700, of whom 31,000 live in Lichfield City (14 sq km). The historic buildings in Lichfield District include Comberford Hall, Comberford Lodge and Comberford Manor Farm, which are Grade II listed buildings. Successive generations of the Comberford family were involved in the civic, political, social and ecclesiastical life of Lichfield over the centuries. The Comberford family interests in the area begin with the successive generations at the very beginning of the family story, each with the name Alan Comberford. [see Comberford 1: The Comberford Family of Comberford, Staffordshire, an introduction] The first of these, Alanus de Cumberford, or Alan of Comberford, who was holding Comberford in the reign of William I or II, ca 1070-1120, from the Beauchamp family, also held land at Chesterfield, near Shenstone, on the south-west fringes of Lichfield. 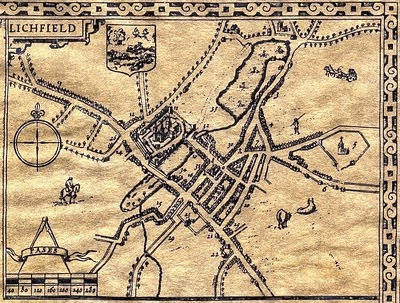 Chesterfield was known to Holinshed as Chesterford and has also been called Campfield. A generation later, Alanus de Comberford, who is mentioned during the reign of Henry I (1100-1135) in the pipe rolls and other Staffordshire records, held lands at Chesterfield in Scertestan (Shenstone), on the edges of Lichfield. In 1166, yet another Alanus de Comberford was “dominus de Comberford.” When he received a grant of the manor and lands of Wigginton, the witnesses included Godfrido Briano, “sacredote” (priest), and Nicholao de Licefelde [of Lichfield]. A generation later, in the reign of Richard I (1189-1199), Shaw notes, the Comberford family owned the Manor of Chesterfield, near Wall, on the southern edges of Lichfield. The Comberford family become directly engaged in the life of Lichfield in the 15th and 16th centuries, with bequests to the Franciscan Friary and four successive generations of the family being admitted to membership of the Guild of Saint Mary and Saint John, which was the effective city government of Lichfield from its incorporation by charter in 1387 until 1548. One member of the family was Master of the Guild, a position that was equivalent to that of Mayor before the incorporation of the city by charter from Edward VI in 1548. When John Comberford died in 1414, he left 10 shillings for masses to the Franciscan mendicant friary in Lichfield. In 1460, William Comberford and his wife Anne extended their land holdings on the edge of Lichfield and in the surrounding district when they succeeded in a legal dispute with Thomas Kegworth and his wife Joan. William recovered seven messuages, two cottages, two gardens, 48 acres of land, 2½ acres of meadow, and 139 acres of pasture in Lichefeld (Lichfield), Longedon (Longdon), Morghwhale (the lost hamlet of Morughale, south-west of Streethay and close to the present Trent Valley Railway Station in Lichfield), Curburgh (Curborough), Stretehay (Streethay), King’s Bromley and Elmehurst (Elmhurst). With his extensive property and commercial interests in Lichfield and his political power in Staffordshire, it was only natural that William would become involved in the civic life of the city. In 1469, as “Will’s Combford,” he was admitted to membership of the Guild of Saint Mary and Saint John in Lichfield, along with Ralph FitzHerbert (“Radius Fitzherbard”), father-in-law of William’s grandson, Thomas Comberford. Within a few years, William Comberford’s son, John Comberford (ca 1426-1508), as “Joh’s Cumberforde,” was admitted to membership of the Guild of Saint Mary and Saint John the Baptist in 1476. Before the end of the 15th century, a third generation of the Comberford family became involved in the governance of the city when Thomas Comberford (ca 1472-1532) of Comberford, as M’r Thomas Cumberforth, was admitted to membership of the Guild of Saint Mary and Saint John the Baptist in 1495. Thomas extended his land holdings and property interests in the Lichfield area in 1499, when he and David Rochford, a Lichfield mercer, leased the manor of Timmor for 12 years from John Beaumont. Timmor was a part of the Bishop of Chester’s Manor of Lichfield (later Longdon). We have a good account of Thomas Comberford’s land holdings in the Lichfield area around the year 1525, when John Archard, Master of the Guild of Saint Mary and Saint John, recorded the land holdings of the guild on the outskirts of the city and also provided a thorough account of neighbouring estates held by Thomas Comberford, particularly in Wall and Wigginton. In that account, Archard spelt the family’s name variously as Comberfort, Combyrford, Combyrforde, Combyrfort, Cumberforde, Cumberforte and Cumbyrford. Humphrey Comberford, who was married to a niece of Elizabeth (or Anne) Stanley of Hammerwich, near Lichfield, and of John de Wolseley, [See Comberford 4: Comberford wealth from Wednesbury] was the fourth generation of his family to take an active role in the life of the Lichfield Guild. In 1530, as “Humfridus Cumberforde,” he became the Master of the Guild of Saint Mary and Saint John the Baptist. In the same year, his sister-in-law, “Dame Isabella Cumberforde” (Isabel Biggs), wife of Judge Richard Comberford [see Comberford 7: The Quaker Comberfords of Bradley, Staffordshire] was admitted to membership of the guild, indicating her strong commercial interests in the city. The importance of the guild in the civic life of Lichfield began to fade after 1548, when Lichfield was incorporated as a city under a charter from Edward VI. The lordship and manor of Lichfield, previously held by the Bishop of Lichfield, were leased to the Corporation of Lichfield, and the town’s government was vested in two bailiffs and 24 burgesses. Five years later, in 1553, Queen Mary made Lichfield a county separate from the rest of Staffordshire. During the reign of Queen Mary, Humphrey Comberford’s brother, Henry Comberford (ca 1499-1586), became Precentor of Lichfield Cathedral in 1555, and he was a key figure in the events surrounding the Reformation in Lichfield. Henry was Precentor of Lichfield Cathedral from 9 June 1555 until 1559, and Prebendary of Bishop’s Itchington at the same time. The precentor was the first residentiary canon of Lichfield Cathedral, and as such was a Justice of the Peace or Magistrate for the Cathedral Close. For many centuries the precentor’s residence traditionally has been at No 23 in the Cathedral Close in Lichfield. Bishop’s Itchington, or Fisher’s Itchington, near Stratford-on-Avon, Warwickshire, takes its name from the River Itchen and from the Bishops of Lichfield, the former landowners of the village. The prebend of Bishop’s Itchington was traditionally held by the Precentor of Lichfield. Henry Comberford was still Prebendary of Bishop’s Itchington on 15 April 1558, and appears on the pardon roll of 15 January 1559. In February 1559, the two bailiffs of Lichfield City, Edward Bardell and John Dyott, accused Comberford of “lewd preaching and misdemeanour.” He was summoned before the Privy Council on 27 February, was deprived of all his benefices because of his extreme Catholicism, and was in prison until April. Four months later, in June 1559, Ralph Baynes was deprived as Bishop of Coventry and Lichfield. At the same time, the Dean of Lichfield, John Ramridge, was sent to the Tower; when he was released on bail, Ramridge escaped to Flanders, where he was later murdered. In addition, the Chancellor, Alban Longdale, was deprived, the Treasurer, George Lee, resigned, and many of the prebendaries and cathedral clergy were deprived or forced to resign between 1559 and 1564. In a report on the recusants of Staffordshire in 1562 Edward Grindall, Bishop of London, described Henry Comberford as “learned, but wilful,” and he was deprived as the Precentor of Lichfield and Prebendary of Bishop’s Itchington that year. Henry Comberford was subsequently ordered to live in Suffolk, although he was given liberty to travel twice every year into Staffordshire, for six weeks on each occasion. In 1570, he was before the Yorkshire ecclesiastical commissioners, charged with defending the Mass. By 1579, when he was aged 80, Henry Comberford was a prisoner in Hull for his religious beliefs, which were regarded as dangerous to the state. He died on 4 March 1586 in Hull Prison. Henry Comberford’s Catholic views were shared by his sister, Dorothy Comberford, wife of Christopher Heveningham of Aston and Pipe Hall. Pipe Hall, the manor of Pipe at Burntwood, west of Lichfield, is part of Saint Michael’s Parish, Lichfield, and during the reign of Elizabeth I, according to Greenslade, “the manor was a nest of Papists.” Dorothy was fined with her cousin Katherine Badduley or Bodlilighe of Stone for non-attendance at church in 1581. In 1606, her son, Sir John Heveningham of Pipe Hall, a “suspected papist,” was accused of failing to attend church at Saint Chad’s Church, Stowe, but he defended himself by pointing out that he had worshipped at Lichfield Cathedral and arguing that Stowe was not a parish church. The Comberford family interests in the area continued throughout this time, and in 1586 William Comberford was still in possession of the lands at Chesterfield that had been owned by the family for generations. On 27 April 1586, he was in Lichfield when he was robbed violently in nearby Shenstone. He was set on by “Little Neddy,” a well-known highwayman, who robbed him of £72, a £5 gold ring, and a sword. Later, Little Neddy (Edward Stevenson) was apprehended and convicted. With the outbreak of the English civil war in the mid-17th century, both Colonel William Comberford and his nephew, also William Comberford, were involved in the events surrounding the siege of Lichfield. William Comberford ‘the nephew’ appears to have lived in Lichfield, drawing on his neighbours in the city to form trusts that secured his interest in the mortgaged Comberford estates, acting as godfather to the children of many leading citizens in Lichfield, and leaving bequests to them at his death. When a list of trained horse was taken at Stafford on 5 June 1634 and at Lichfield on 2 October 1634, Colonel William Comberford of Tamworth and his nephew, William Comberford of Comberford, were listed as being liable for one cuirassier each. As the civil war unfolded, Colonel William Comberford was appointed High Sheriff of Staffordshire. On 2 February 1643, he wrote from a besieged Stafford to his kinsman Ralph Weston of Rugeley, asking him to send “with all speed to Lichfield” for muskets and fowling pieces to help in the defence of Stafford. The assault on Lichfield in March 1643 was led by Richard Greville, 2nd Lord Brooke, and Sir John Gell. Brooke was notorious for his hostility to the church. As he was leaning out the window of a house in Dam Street when he was hit by a deflected bullet in a shot fired from the central tower of Lichfield Cathedral fired by a sniper, John “Dumb” Dyott, who was a godson of William Comberford’s nephew, William Comberford. The incident took place on 2 March, Saint Chad’s Day, and because of this coincidence the accidental killing of Brooke was quickly hailed as a miracle by the royalists. Lichfield was captured by the besieging parliamentary forces three days later, on Sunday 5 March 1643. During the fighting that ensued in Lichfield, two people from Comberford died as they fought on the Parliamentarian side: Richard Waughton of Comberford was killed as he took part in building a trench on the west side of Lichfield, outside the Cathedral Close, and he was buried in Saint Editha’s Church, Tamworth, on 21 March 1643; Thomas Riccard of Comberford died in fighting in the Cathedral Close. During the siege of Tamworth in June 1643, Comberford and his supporters sought refuge with the Ferrers family in Tamworth Castle. The siege of the castle lasted a mere two days before the castle was captured by a parliamentary detachment commanded by Colonel William Purefoy. After the fall of Tamworth, as the Moat House was being sacked, William Comberford escaped to Lichfield, where once again he joined the royalist army defending the city against a new siege. In his will, William Comberford left a book of pedigrees of the Nevilles, Earls of Warwick to his friend, Frances, Marchioness of Hertford, later the Duchess of Somerset: “The book of pedigrees of the Earles of Warwick, I give and devise to the Right Honorable and trulie virtuous ladie, the Marchioness of Hertford, for whose sake … I bought the same.” This “truly virtuous lady” was the former Lady Frances Devereux (1599-1674), a sister and co-heir of Robert Devereux, 3rd Earl of Essex, and the youngest child of Robert Devereux, 2nd Earl of Essex, Lord of the Manor of Lichfield. Her husband, William Seymour (1587-1660), Duke of Somerset, whom she married at Drayton Basset, near Tamworth, on 3 March 1616, was the Recorder of Lichfield. As Dowager Duchess of Somerset, she was also the tenant of properties in Comberford, Wigginton and Tamworth between 1662 and 1674. When she died on 24 April 1674, she left her collection of 1,000 books to Lichfield Cathedral, including the Saint Chad’s Gospel, which continues to be used in liturgical processions in Lichfield Cathedral. Meanwhile, William Comberford’s nephew, also William Comberford, had moved to secure his interests in the Comberford estates through the formation of trusts involving some of the leading citizens of Lichfield. On 16 May 1641, William Comberford’s nephew, William Comberford, placed all his interests in the Comberford estates in a trust formed by three trustees, Sir Richard Dyott of Lichfield, John Birch of Cannock and Thomas Wollaston. This appears to have been an effort to secure the ownership of the estates against any loans and mortgages, to ensure that Comberford Hall, then occupied by his kinsman Francis Comberford, returned to his immediate heirs, and to guarantee that the estates remained in the hands of the Comberford family whatever difficulties might face the family in the coming crisis. Without actual possession of the Comberford estates, William may have lived on in Lichfield. This is indicated in his choice of leading Lichfield residents in the formation of his trusts, by his ties as godfather to the children of key people in Lichfield at the time, and by the many bequests in his will to people who lived in Lichfield. 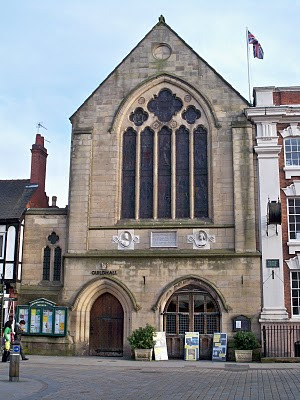 The first trustee, Sir Richard Dyott (died 1659) of Freeford Manor, Stichbrooke and Saddler Street (now Market Street), Lichfield, was Steward and Recorder of Lichfield, and had been MP for Lichfield in the 1620s. He later commanded the royalist troops at the Siege of Lichfield in 1643. Sir Richard’s brother, John Dyott, who played a dramatic role in the siege of Lichfield, was William Comberford’s godson, while another brother, Matthew Dyott of Stychbrooke, was married to Mary Babington, a distant cousin of William Comberford, and a sister-in-law of the second trustee, John Birch. The second trustee, John Birch, a lawyer, of Leacroft, Cannock, was the son of John Birch of Bloxwich, near Lichfield. The younger John Birch was married to Margaret Babington of Curborough near Lichfield. 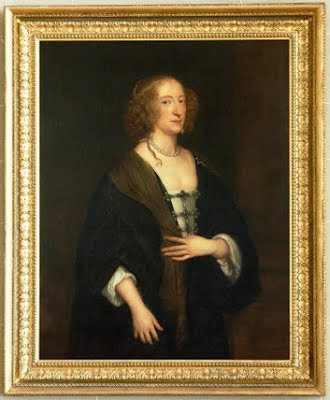 Her sister Mary was married to Matthew Dyott of Stychbrook, a brother of both Sir Richard Dyott and John ‘Dumb’ Dyott, while her brother, Canon Matthew Babington, was a chaplain to Charles I and a canon of Lichfield Cathedral. The third trustee, Thomas Wollaston, was a member of a prominent family in the Lichfield and Walsall areas. In his will, William Comberford removed Sir Richard Dyott as a trustee of his estates, and replaced him with his brother John Comberford, retaining John Birch and Thomas Wollaston as trustees and his executors. The move was timely, for on 16 August 1646, the Parliamentary Committee of Staffordshire sequestered all the estates of Sir Richard Dyott, including his lands in Lichfield, Freeford, Stychbrook, Chorley and Stafford. In his will, William provided bequests for his brothers Robert Comberford (£100) and John Comberford, John’s wife, his sisters Ann, Agatha, Elizabeth and Hester, and his kinsman, Francis Comberford of Bradley. Other bequests or legacies were made to the benefit of his friends John Birch, Thomas Wollaston, Robert Stanley, Joseph Gorwey, Thomas Wollaston’s son John, his cousin George Hawe, and his servant William Pirbard of Comberford, expressing the hope that each of them would buy a gold ring with the 20 shillings he had left them. He left £5 for each of his godchildren, John Dyott, “sonne of Anthony Dyott, Esqr, Doctor of Phisiche, lately residing in the citie of Lichfeild (sic),” … …, son of Thomas … of Whittington, Robert Ward, son of Alexander Ward of Shenstone, Staffordshire, and Elizabeth Goode, daughter of the Revd Francis Goode of Yoxall, asking that they use the £5 to buy plate “having my name and armes engraven thereon.” He also left £5 in cash to three other godchildren, Mary Walmsley, daughter of Richard Walmsley of Lichfield, Mary Baxter, daughter of Richard Baxter of Whittington, and Mary Pirbard, daughter of William Pirbard of Comberford. The bequests to John Dyott and the other godchildren show William’s continuing connections with the families who had fought on the royalist side during the sieges of Lichfield: John Dyott had fired the fatal shot that killed Sir John Gell during the siege of Lichfield three years earlier in March 1643 (see above). Richard Ward was the youngest son of Alexander Ward, an innkeeper in Lichfield who was Bailiff of Lichfield on three occasions. Alexander Ward had acquired a large estate in Shenstone and was buried there when he died on 10 December 1663 at the age of 75. Both Alexander Ward and Richard Walmsley were royalist officers during the sieges of Lichfield, fighting under Colonel Hervey Bagot. Richard Walmsley or Walmisley was the appraiser of probate in the Diocese of Lichfield. He was the father of both William Comberford’s god-daughter, Mary, and William Walmesley, who was Registrar of Lichfield (1692), JP for Staffordshire, Whig MP for Lichfield City (January to November 1701), and Chancellor of the Diocese of Lichfield from 1698 until his death in 1713. He was accused of misusing charitable funds in the January 1701 election, and was almost unseated as MP for Lichfield on petition. He was a Whig candidate for Lichfield again in 1710 but was soundly beaten. He was dismissed as a JP in 1712, and was denounced as self-interested and insolent in politics. He died in July 1713. In 1675 he married Dorothy, daughter of Humphrey Gilbert of Fradley, and they had three sons, including Gilbert Walmesley, Samuel Johnson’s mentor, and William Walmesley, who was Dean of Lichfield Cathedral from 1720 to 1730. After the civil war and the Caroline restoration, the Comberford family appears to have continued to have a town house in Lichfield, although they were involved at a much quieter level in the life of the city. At the age of 69, William Comberford’s brother, Robert Comberford, attested the Comberford family tree in Lichfield on 30 March 1663, the first day of the Visitation of Staffordshire conducted by the antiquarian and the Norroy King of Arms, Sir William Dugdale (1605-1686). Dugdale, who later became Garter Principal King of Arms, had received the degree MA at Oxford with Robert Comberford’s uncle, William Comberford, in November 1642. In 1641, he had been commissioned in 1641 to make a copy of all the monuments in English cathedrals and churches, including Lichfield Cathedral and Saint Editha’s Church, Tamworth. At the visitation in Lichfield in March 1663, Dugdale was assisted by two heralds who were born in Lichfield and educated at Lichfield Grammar School – his clerk, Gregory King (1648-1712), who later became Lancaster Herald and a pioneering statistician, and Dugdale’s son-in-law, Elias Ashmole (1617-1692), who held the office of Windsor Herald and who was to become Lichfield’s most noted antiquarian. Ashmole was born in Breadmarket Street, Lichfield, and like Dugdale was, undoubtedly, familiar with the career of Robert’s brother, William Comberford. During the English Civil War, Ashmole was appointed the King’s Commissioner of Excise at Lichfield in 1644. Soon afterwards, he was given a military post at Oxford, where he devoted most of his time to study and at Brasenose College, although he did not formally enrol as a student. In late 1645, he left Oxford to accept the position of Commissioner of Excise at Worcester. Ashmole was given the additional military posts of Captain of the Horse and Comptroller of Ordnance, though he seems never to have taken part in any fighting. Robert Comberford furnished Ashmole with many of the details of the Comberford or Cumberford (the spellings are used interchangeably, even in one manuscript) family, although Grazebrooke is pertinent when he asks why Robert failed to furnish a number of pertinent particulars, including the full name of his father-in-law. In addition, it might be asked why he failed to provide dates of death for his brothers and sisters, or particulars of their marriages and children, some of which ought to have been known to Ashmole and perhaps to Dugdale too. Robert must have been in his late 50s or early 60s when he married Catherine Bates of Sutton, Derbyshire, and she appears to have been at least 30 years younger than him. The Bates family was a Catholic family and in the late 17th century they moved to Pipe Hall, outside Lichfield, the former home of the Heveningham family (see above). The widowed Catherine Comberford was still living in 1683, perhaps in Lichfield, when she filed a renunciation in Lichfield of any interest in the estate of her daughter, Mary Giffard, who had just died. The administration of the personal estate of Mary Giffard of Comberford was then granted at Lichfield to her sister Anne Brooke. The estate at Comberford Hall had been claimed unsuccessfully by Robert Comberford’s cousin, Francis Comberford, the Quaker of Bradley. Francis Comberford’s daughter, Anne (ca 1644?-post 1667), was married in Lichfield on 12 November 1667 to Richard Meighim, a tanner from Shropshire. 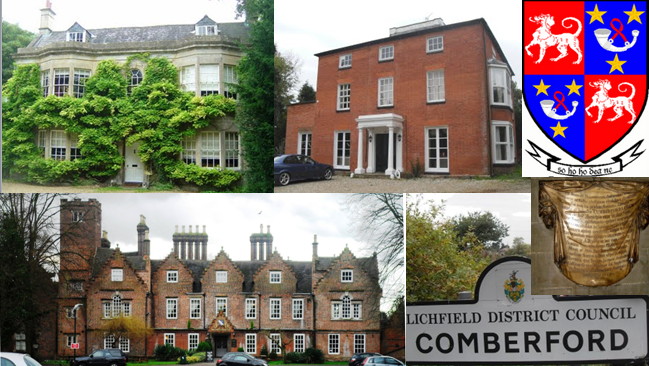 The subsequent owners of the former Comberford estates at Comberford, the Moat House in Tamworth and in Wednesbury continued to be engaged in the civic and cultural life of Lichfield. Lord Donegall, who owned Comberford Hall at the end of the 18th century, gave his name to Donegal House in Bore Street, Lichfield. Donegal House was built in 1730 by a local merchant James Robinson, whose great-grand-daughters, Ellen-Jane and Marianne, who died in 1812, are commemorated as the “Sleeping Children” in Lichfield Cathedral in a marble memorial sculpture by Sir Francis Chantrey (1817). 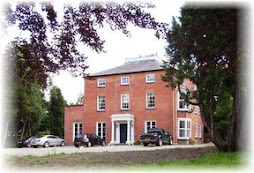 William and Hill Boothby, who owned the Moat House in Tamworth, were the great-grandparents of Sir Brooke Boothby (died 1824), a member of the Lichfield literary circle that included Anna Seward, Erasmus Darwin and Richard Lovell Edgeworth. Sir Edward Dolman Scott (1793-1851), the last member of his family to hold the former Comberford estates at Wednesbury, was MP for Lichfield. The close engagement of the Comberford family with the civic, political, social and ecclesiastical life of Lichfield, and their extensive property interests in the surrounding area, also offer plausible explanations for the Comberford coat-of-arms, which also came to be used by the Comerford family in Ireland. The Comberford family’s extensive property interests in Lichfield included lands in Streethay (Stretehay) and the lost hamlet of Morughale (Morghwhale), beside Streethay, in Saint Michael’s Parish, Lichfield. These holdings were consolidated as family possessions with William Comberford’s successful legal action in 1460. Streethay is 1½ miles east of Lichfield City Centre, close to Lichfield Trent Valley Station. William’s land-holdings in Streethay may explain the Comberford heraldic bearings of a red shield charged with a white hunting dog (gules, a talbot passant argent). Similar arms were used by two neighbouring families, the Strethay family of Lichfield (argent, a lymmer hound gules), and the Wolseley family of Wolseley (argent, a talbot passant gules). As William was admitted to membership of the Guild of Saint Mary and Saint John in Lichfield in 1469, he may have been anxious to emphasise his commercial and civic links with the cathedral city by using heraldic emblems that obviously identified him with the city. Later, Humphrey Comberford married a niece of John Wolseley of Bloxwich, near Lichfield. Once again, these close family ties may have been emphasised by using arms that were visibly identifiable with the Lichfield area. On 21 March 1939, in Saint Vincent’s Church, Vauxhall, Mary married Maurice Bernard Perrett of 191 Saint Saviour’s Road, Birmingham, and they later lived in Lichfield, Staffordshire, where she died in June 1980. 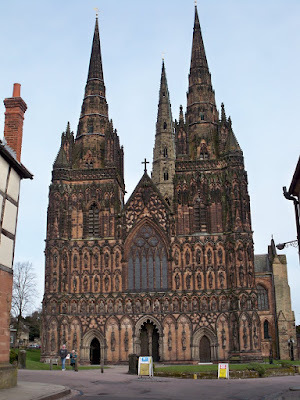 For my blog pages on recent return visits to Lichfield visit follow this link. 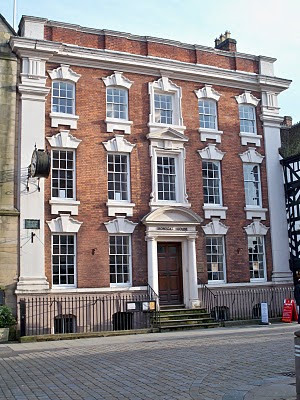 Lichfield Record Office, The Friary, Lichfield WS13 6QG, is at: http://www.staffordshire.gov.uk/leisure/archives/LichfieldRecordOffice/. This site allows visitors to search for papers relating to the Comberford family and Comberford Hall and village. ‘Lichfield District,’ http://en.wikipedia.org/wiki/Lichfield_(district) (30.8.2008); ‘Tamworth Rural District,’ http://en.wikipedia.org/wiki/Tamworth_Rural_District (30.8.2008). Shaw 1, p. 356; Adams, p. 14. Erdeswick’s Survey, p. 158; Erdeswick, pp 329-330; Shaw 1, p. 431, quoting Harl. Mss. 509; Shaw 1, p. 434; Adams, p. 14. Reg. Henry Chichele, 3, p. 269. ‘Staffordshire Fines: Henry VI,’ SHC 11 (1890), pp 228-238. (Revd) Thomas Harwood, The History and Antiquities of the Church and City of Lichfield (1806), p. 405. ‘Townships: Fisherwick with Tamhorn,’ A History of the County of Stafford: vol 14: Lichfield (1990), pp 237-252; www.british-history.ac.uk/report.aspx?compid=42360 (30.8.2008); National Register of Archives, Massereene (Staffordshire) deeds, no. 22. ‘Visitations of Staffordshire,’ SHC 5/2 (1884), p. 92; Visit Warwicks, p. 35; Shaw 1, p. 434; Erdeswick, p. 293; Adams, p. 8. Shaw 1, pp 287, 289, 297, 434; Adams, pp 8-9; Visit Warwicks, p. 35; Alum. Cantab, 1/1, p. 377; Harwood, pp 193, 195, 420; Bagnall, p. 130; Acts of the Privy Council 1558-1570, pp 60, 64, 71, 87; C.P.R. 1558-1560, p. 170; Cal. S.P. Dom. 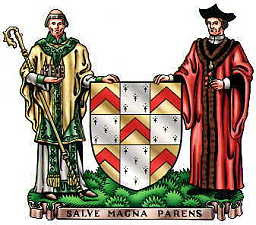 Addenda 1547-1565, p. 522; ‘Precentors of Lichfield,’ Fasti Ecclesiae Anglicanae 1541-1857: vol 10: Coventry and Lichfield diocese (2003), pp 16-18, 78-94, http://www.british-history.ac.uk/report.asp?compid=%2034739, 34773 (28.4.2007); VCH Staffs 3, p. 169; Greenslade, Catholic Staffordshire, pp 39-40; Greenslade, ‘The Popish of Lichfield,’ pp 129-130; Greenslade, A history of Lichfield … Ecclesiastical History, p. 155; Savage, pp 11-13; Upton, pp 44-46; ‘Bishop’s Itchington,’ http://%20en.wikipedia.org/wiki/%20Bishops_Itchington (14.5.2007); JH Pollen, Unpublished Documents Relating to the English Martyrs, vol 1 (Catholic Record Society, 1909), p. 192; http://library.ferris.edu/~cochranr/gen/fam00251.htm (17.8.2007). Greenslade, A history of Lichfield … Ecclesiastical History, pp 57-59. See: ‘Parishes: Bishop’s Itchington,’ A History of the County of Warwick, vol 6, Knightlow hundred (1951), pp 121-124; http://www.british-history.ac.uk/report.aspx?compid=57111 (4.4.2009). Dyott, who was an uncle of Sir Richard Dyott (see Comberford 5: Recusants, royal guests and civil war), is referred to in Shakespeare’s Henry IV Part 2, Act 3, Scene 2, in the dialogue between Shallow and Silence. Shaw 1, pp 287, 289, 297, 434; Alum Cantab, 1/1, p. 377; Harwood, pp 193, 195, 420; Bagnall, p. 130; Adams, pp 8-9; Acts of the Privy Council 1558-1570, pp 60, 64, 71, 87; C.P.R. 1558-1560, p. 170; Cal. S.P. Dom. Addenda 1547-1565, p. 522; ‘Precentors of Lichfield,’ Fasti Ecclesiae Anglicanae 1541-1857: vol 10: Coventry and Lichfield diocese (2003), pp 16-18, 78-94, http://www.british-history.ac.uk/report.asp?compid=%2034739, 34773 (28.4.2007); VCH Staffs 3, p. 169; Greenslade, Catholic Staffordshire, pp 39-40; Greenslade, ‘The Popish of Lichfield,’ pp 129-130; Greenslade, A history of Lichfield … Ecclesiastical History, p. 155; Savage, pp 11-13; Upton, pp 44-46; ‘Bishop’s Itchington,’ http://%20en.wikipedia.org/wiki/%20Bishops_Itchington (14.5.2007). Bagnall, p. 130; JH Pollen, Unpublished Documents Relating to the English Martyrs, vol 1 (Catholic Record Society, 1909), p 192; http://library.ferris.edu/~cochranr/gen/fam00251.htm (17.8.2007). ‘Visitations of Staffordshire,’ SHC 5/2 (1884), p. 173; Visit Warwicks, p. 35; VCH Staffs, p. 206; Shaw 1, p. 434; SHC 3/2 (1882), p. 52, f.n. ; Adams, pp 8, 20; Greenslade, Catholic Staffordshire, pp 87, 104-105, 110 n. 26; Greenslade, ‘The Popish of Lichfield,’ p. 131; Greenslade, A History of Lichfield … ecclesiastical history, p. 139. SHC 1927, p. 139 n 21; Adams, pp 10-11, 20. Hastings Manuscripts 2 (1930), pp 88-89. Shaw 1, pp 238, 362; SHC 5/2 (1884), p. 118; Visit Staffs, pp 76-77; Clayton, pp 22, 24, 159; Upton, pp 53-55; David Crystal, By Hook or by Crook, a journey in search of English (London: HarperPress, 2007), pp 215-216. Upton, pp 55-56; Clayton, Loyal and Ancient City, pp 86, 121. ‘House of Commons Journal vol 3: 4 April 1643,’ Journal of the House of Commons, vol 3: 1643-1644 (1802), pp 28-30, http://www.british-history.ac.uk/report.asp?compid=8391&strquery=Comberford (28.4.2007); ‘House of Lords Journal vol 6: 26 May 1643,’ Journal of the House of Lords, vol 6: 1643 (1802), pp 63-65, http://www.british-history.ac.uk/report.asp?compid=37256&strquery=comberford (28.4.2007); Martyn Bennett (1999), p. 37. Adams, p. 12; Stone, p. 59; Mabel Swift (2006), pp 22-23. National Archives, Probate 11/258, f. 310; abstract of will in Comberford Family Papers, D 5368/3/10/1-7; Staffordshire Record Office, Littleton and Parker family papers, D 260/M/T/2/42; Complete Peerage 12/1, pp 69-73; Burke’s Peerage, various eds, s.v. Somerset; Greenslade, A History of Lichfield … ecclesiastical history, p. 56. I have most recently seen the Saint Chad’s Gospel being used in the liturgical procession in Lichdield Cathedral on the Day of Pentecost, 27 May 2012. See the will of William Comberford, National Archives, Probate 11/239, f. 235; and of Robert Comberford, National Archives, Probate 11/332, f. 440. SHC 5/2 (1884), pp 24, 42-43, 63, 118; Visit Staffs, pp 76-77; Clayton, pp 5, 14, 69, 74, 115, 122; Upton, pp 53-54; see William Comberford’s will, National Archives, Probate 11/239, ff 235. SHC 5/2, ‘The Visitations of Staffordshire,’ pp 24, 42-43, 63; ‘Cannock: Manors and economic history,’ VCH Staffs 5 (1959), pp 49-63, http://www.british-history.ac.uk/report.asp?compid=53397 (22.6.2007); see Clayton, p. 106. SHC 5/2, ‘Visitation of Staffordshire,’ pp 320-322. National Archives, Probate 11/239, f. 235; National Archives, Probate 11/239, 11/246; Clayton, pp 129-132; Harwood, pp 35-36. National Archives, Probate 11/239, f. 235. ‘The Visitations of Staffordshire,’ SHC 5/2 (1884), p. 75. Ward’s inn is not identified in the most recent study of Lichfield public houses and inns: John Shaw, The Old Pubs of Lichfield (Lichfield: George Lane Publishing, 2007). Clayton, pp 48, 60, 72; Salt Historical Collection, Mss 596. ‘Lichfield: Parliamentary representation,’ VCH Staffs, vol 14 (1990), pp 92-95; ‘Gateway to the Past: Staffordshire and Stoke-on-Trent’s Heritrage’: http://www.archives.staffordshire.gov.uk/ (28.9.2007); TG Lomax, A short account of the Cathedral of Lichfield, with plates and woodcuts (Lichfield: TG Lomax, 1843), p. 43. SHC 2/2 (1881), p. 35; SHC 5/2 (1884), ‘The Visitations of Staffordshire,’ pp viii, 91-92. See Chris Upton, A History of Lichfield, pp 71-74. Richard Garnett, ‘Ashmole, Elias (1617–1692),’ Dictionary of National Biography (London: Oxford University Press, 1891, repr. 1973); Michael Hunter, ‘Ashmole, Elias (1617–1692),’ Oxford Dictionary of National Biography (London: Oxford University Press, 2004). HS Grazebrooke, ‘Preface,’ SHC 5/2 (1884), p. xii. ‘Visitation of Staffordshire,’ SHC 5/2 (1884), p. 92; Visit Staffs, p. 55; Shaw 1, pp 428, 434; Comberford memorial, transcribed and photographed by Patrick Comerford, 22.3.2007; Adams, pp 13-14 (however, Adams is mistaken when he gives Catherine’s name as Mary, see Adams, p. 14); Greenslade, ‘The Popish of Lichfield,’ p. 131. Note added to ‘Visitation of Staffordshire,’ SHC 5/2 (1884), p. 92. Upton, pp 150-152; (Revd Canon) Tony Barnard, Lichfield Cathedral (The Pitkin Guide, Norwich: Pitkin, 2001), pp 18-19; Patrick Comerford, visits to Lichfield Cathedral 1970-2018 (latest visits, 19-21.3.2009, 11-12.8.2009; 3-4.3.2010, 11-13.6.2010; 26-27.2.2011, 11-13.8.2011; 25-27.5.2012, 6-8.11.2012; 29-31.3.2013, 30.10-1.11.2013; 27.2.2014, 12-13.5.2014, 6-7.6.2014; 16-17.1.2015, 31.5.2015, 24-25.6.2015, 23-24.6.2015, 23-24.10.2015; 1-2.3.2016, 13.5.2016, 23.5.2016, 5-6.6.2016; 17-19.4.2017; 23-24.11.2017; 24-25.1.2018, 24-25.4.2018, 22-23.11.2018). Burke’s Peerage, various eds, s.v. Boothby; Upton, p. 115. Burke’s Peerage, various eds, s.v. Scott of Great Barr (1806). See: ‘Townships: Streethay with Fulfen,’ VCH Staffordshire, vol 14: Lichfield (1990), pp 273-282. http://www.british-history.ac.uk/report.aspx?compid=42363 (4.4.2009); ‘History of Streethay,’ http://www.afspc.info/streethay/history (4.4.2009); Patrick Comerford, visits to Lichfield, 1970-2017 (latest visits, 19-21.3.2009, 11-12.8.2009; 3-4.3.2010, 11-13.6.2010; 26-27.2.2011, 11-13.8.2011; 25-27.5.2012, 6-8.11.2012; 29-31.3.2013, 30.10-1.11.2013; 27.2.2014, 12-13.5.2014, 6-7.6.2014; 16-17.1.2015, 31.5.2015, 24-25.6.2015, 23-24.10.2015; 1-2.3.2016, 13.5.2016, 23.5.2016, 5-6.6.2016; 17-19.4.2017, 23-24.11.2017; 24-25.1.2018, 24-25.4.2018, 22-23.11.2018). See Burke’s Peerage, various eds, s.v. Wolseley; Imogene Wolseley, Wolseley: a thousand years of history (Lichfield: The Lichfield Press, 2003), p. 7. Information from, Vince O’Keeffe (27.5.2009). © Patrick Comerford, 2007, 2008, 2009, 2010, 2011, 2012, 2013, 2014, 2015, 2016, 2017. Last updated 4 April 2009, 13 April 2009, 15 August 2009, 23 December 2009; 9 March 2010, 16 March 2010, 13 July 2010, 16 July 2010, 26 December 2010; 23 February 2011, 3 March 2011, 17 and 18 August 2011; 28, 29 and 30 May 2012; 4 August 2012; 16 November 2012; 25 June 2013; 4 November 2013; 5 March 2014; 17 May 2014, 13 June 2014; 28 January 2015, 29 June 2015, 27 October 2015; 3 March 2016, 11 June 2016, 27 and 30 July 2016; 17 February 2017; 29 April 2017; 26 November 2017; 13 May 2018, 26 November 2018.